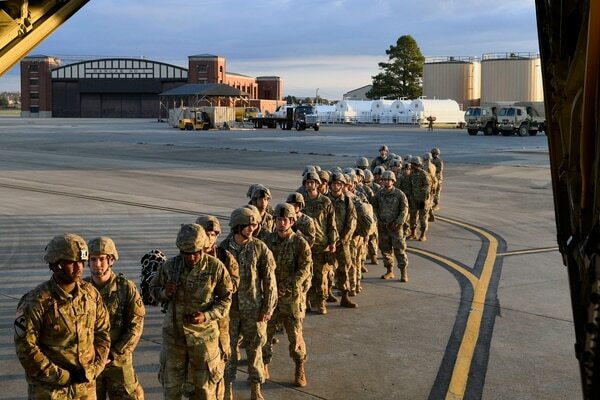 DoD is sending 7,000 troops to the border. Here’s every unit going. President Donald Trump is sending more than 5,000 active duty troops to the southern U.S. border. That number could grow to 15,000 troops. The number of troops headed to the border keeps rising, with 5,600 already deployed and a total of 7,000 expected eventually to support U.S. Customs and Border Protection, U.S. Northern Command officials said Thursday. So far, 2,800 troops are deployed in Texas, 1,300 in California — including 1,100 Marines from Camp Pendleton — and 1,500 are deployed in Arizona. No troops so far have been deployed to New Mexico, although DoD initially indicated they would be. The Pentagon also has no estimate available on how much the operation will cost, said spokesman Army Lt. Col. Jamie Davis. Reporters and lawmakers have pressed officials in the building for weeks now on how much the rapid deployment of thousands of troops would cost. Troops away from their families for more than 30 days may see extra pay.